Queen Caroline and her husband, the future King George II, arrived in London in 1714, when her father-in-law ascended the throne. Zincke enjoyed their patronage, and it is possible that this image is the product of the time he is recorded spending at court drawing portraits of the Royal Family in 1732. In the 17th century, new techniques of painting enamels allowed delicate portraits resembling tiny oil paintings to be created. 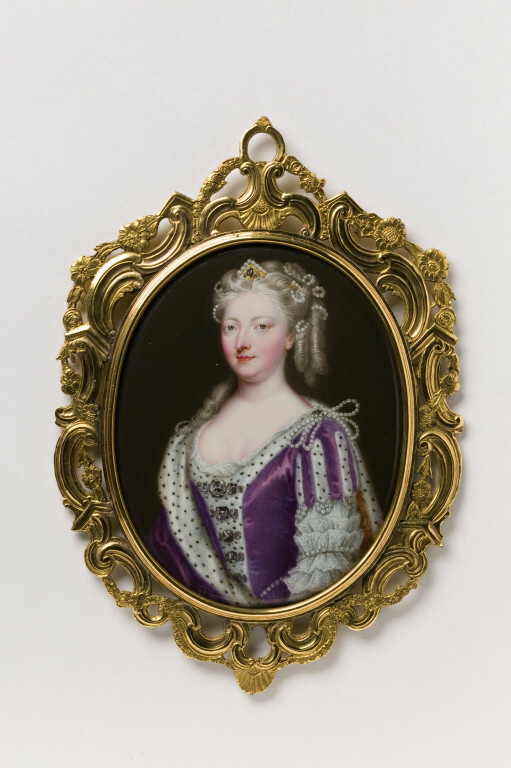 This enamel portraiture in miniature was a truly international art. Many enamellers travelled in order to find new markets, while others migrated to escape religious persecution. Enamel miniatures were first fashionable in continental Europe, but were particularly in vogue in Britain from the 1720s to 1760s. Sir Arthur Gilbert and his wife Rosalinde formed one of the world's great decorative art collections, including silver, mosaics, enamelled portrait miniatures and gold boxes. Arthur Gilbert donated his extraordinary collection to Britain in 1996. Oval portrait miniature of Queen Caroline of Ansbach wearing a purple dress and an ermine-lined purple cape. The miniature is enamel on copper and the oval, pierced scroll frame is of gold with ivory backing. Provenance: R.H. Rockliff. Sale, Sotheby's London, lot 138, 11/11/1947. Estate of the Hon. Lady Shelley-Rolls sale, Christie's London, lot 62, 13/02/1962. S.J. Phillips, London, 1980. Enamel miniature on copper of Queen Caroline of Ansbach, in a pierced gold and ivory frame, England, ca.1732, Friedrich Christian Zincke. Coffin, Sarah and Bodo Hofstetter. 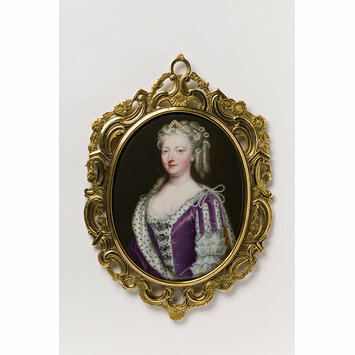 Portrait Miniatures in Enamel. London: Philip Wilson Publishers Ltd. in association with the Gilbert Collection, 2000. 168 p., ill. Cat. no. 72, p. 119. ISBN 0856675334. William Prewett, who trained in Zincke’s studio, was one of the first successful English-born portrait enamellers.